After a number of performance-oriented updates made to the Chevrolet SS last year, the 2016 model features several exterior enhancements that reinforce its commanding presence on the road. A revised front fascia features new, vertical ducts at the outer edges to direct airflow over the front wheel openings to improve aerodynamic efficiency. The fascia also incorporates new LED signature lighting, while new, functional hood vents and new-design 19-inch cast-aluminum wheels contribute to a stronger appearance for the rear-drive sports sedan. Inside, Chevrolet MyLink features a new 8-inch-diagonal radio with standard navigation. What hasn’t changed is the SS’s unique blend of performance, comfort and spaciousness. It features a 6.2L V-8 engine under the hood and turns out an SAE-certified 415 horsepower (310 kW) and 415 lb.-ft. of torque (563 Nm), and offers a six-speed manual transmission or a paddle-shift six-speed automatic transmission. 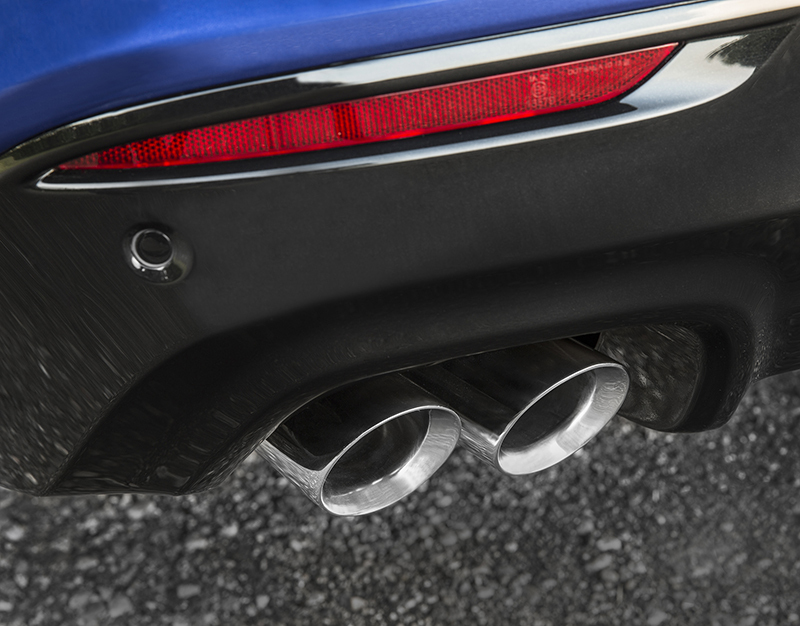 A new, dual-mode exhaust system for 2016 complements the V-8 engine with quieter performance at low engine speeds and a more muscular engine note at wide-open throttle. Adding to the performance-focused SS, Magnetic Ride Control – the world’s fastest-reacting damping system – is a standard feature. It provides more precise body motion control that equals a more responsive and refined ride. State-of-the-art Brembo brakes, standard in the front and rear, are also included on the vehicle. With the automatic transmission and its performance-oriented 3.27 final-drive ratio, the Chevrolet SS accelerates from 0 to 60 mph in about five seconds, making it one of the quickest sedans on the market. Models equipped with the manual transmission feature a more aggressive 3.70 axle ratio for even stronger acceleration. Cast aluminum wheels, wrapped in ultra-high-performance Bridgestone tires: 19 x 8.5-inch wheels with 245/40ZR19 tires in front; 19 x 9-inch wheels with 275/35ZR19 tires at the rear. 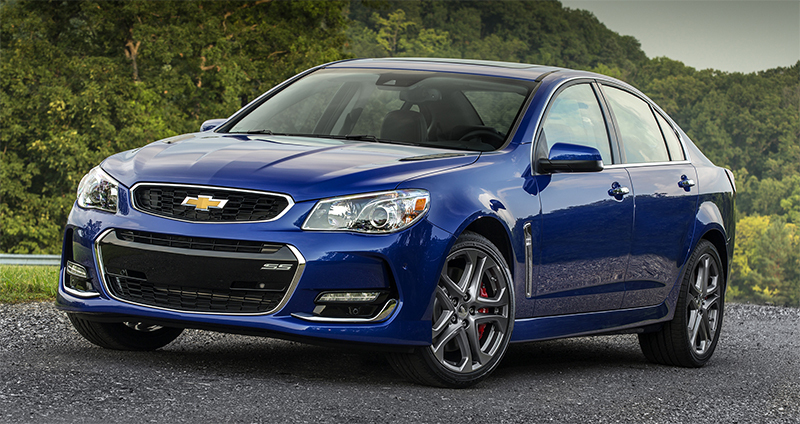 The SS’s good looks are a well-balanced mix of performance cues and premium details. Staggered front and rear wheels, which are pushed out to the corners, enhance the sporting, muscular stance of the SS. Up front, the aluminum hood – with new, functional vents – features a subtle “power bulge” hinting at the capability of the engine underneath. New signature LED lighting at the front illuminates the powerful design, while the front fascia now includes ducts on each side to direct airflow over the front wheel openings to enhance aerodynamic performance. At the rear, the tapered, tear-drop shape contributes to improved aerodynamic performance. Premium cues include jewel-like chrome accents, standard high-intensity discharge headlamps and light-emitting diode daytime running lights. Along the vehicle’s sides, a character line extends from the hood to the trunk lid, helping create a classic wedge shape by further accentuating the planted appearance and muscular sheet metal. The vehicle tapers at the rear, with the C-pillar flowing into the deck lid – a design cue shared with other Chevrolet sedans. Slipstream Blue, a new exterior color, is also available on 2016 models. The roomy interior of the SS comfortably accommodates five adults, with 42.3 inches of front legroom (1,074 mm) and 39.7 inches (1,008 mm) of rear legroom. Leather seating surfaces are standard, as are eight-way power adjustable front bucket seats with additional side bolstering that hug the driver and front passenger in tight-handling situations. The SS emblem is prominently stitched onto the soft-touch instrument panel which features two types of chrome finishes – a satin gloss and bright chrome. An integrated center stack includes infotainment, climate and other vehicle controls, while the center console of the SS houses dual cup holders that can accommodate a wide range of container sizes. The cup holders are not separated, so the space can also be used for small item storage. In addition, all four doors contain cup holders. An electric park brake frees up additional space in the center console. Two auxiliary power outlets allow concurrent charging of items such as mobile phones, tablets and portable satellite navigation devices. One is located inside the covered central storage console; the other outlet is conveniently accessible in the forward compartment at the base of the instrument panel. Remote start (with automatic transmission). The SS interior is offered exclusively in black, and a power sunroof is available. 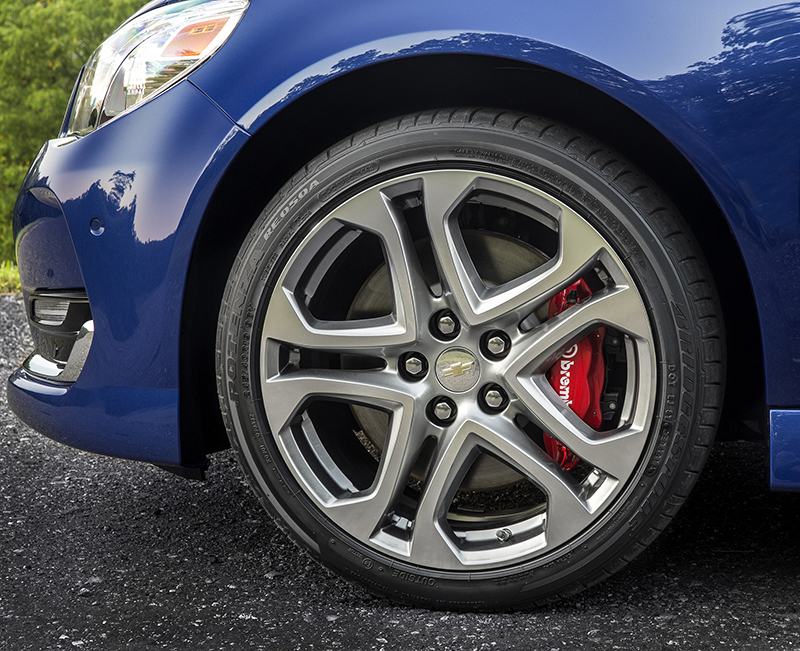 The 2016 Chevrolet SS sedan features several exterior enhancements that reinforce its commanding presence on the road. A revised front fascia features new, vertical ducts at the outer edges to direct airflow over the front wheel openings to improve aerodynamic efficiency. The fascia also incorporates new LED signature lighting, while new, functional hood vents and new-design 19-inch cast-aluminum wheels contribute to a stronger appearance for the rear-drive sports sedan. The Chevrolet SS’s MyLink system gives customers the best of both worlds when it comes to infotainment. It provides easy, intuitive operation of basic functions, yet it is also highly customizable and capable of linking multiple devices such as smartphones, SD cards and MP3 players, giving users more ways of staying connected. Connectivity and convenience includes a Text Message Alert feature for smartphone users with Bluetooth profile (M.A.P. ), which reads incoming texts through the vehicle’s speakers, and Siri Eyes Free for iPhone iOS 6 and iOS 7 users to enhance connectivity and convenience. Each enables voice-controlled connectivity, to help keep phones safely stored and hands on the wheel. OnStar 4G LTE with Wi-Fi hotspot complements the SS’s connectivity by providing a mobile hub for drivers and passengers to stay connected. The hotspot is on whenever the vehicle is on and comes with a 3GB/three-month data trial. 4G LTE is the most current and fastest mobile data network – 10 times faster than 3G and 100 times faster than a 2G network. And with OnStar, it also offers stronger, broader coverage than smartphones on the same network and it’s easy to use: If the vehicle is on, the connection is on. The 6.2L LS3 small-block V-8 is the power behind the SS’s driving experience. It is SAE-certified at 415 horsepower (310 kW) and 415 lb.-ft. of torque (563 Nm). The engine’s torque is channeled to the limited-slip rear axle via a TREMEC TR6060 six-speed manual or Hydra-Matic 6L80 six-speed automatic transmission with paddle-shift control. A 3.27 axle ratio is standard with the automatic transmission and a 3.70 gear is matched with the manual transmission. An engine oil cooler is standard and a transmission cooler is included on automatic-equipped models. The SS’s sport-tuned suspension complements the powertrain with handling prowess and driving refinement. The front suspension is a MacPherson-strut-based multi-link system with a direct-acting stabilizer bar. It features a forward-mounted steering rack and dual lower links with individual ball joints at the outer ends. At the rear is a multi-link independent suspension with high lateral stiffness for great handling, thanks to three lateral ball joints per side. A rubber-mounted rear suspension frame isolates the body from road imperfections and drivetrain vibrations, while lightweight aluminum suspension components front and rear, including the front steering knuckle and tension arms, contribute to tremendous ride and handling characteristics. Damping for the sophisticated front and rear suspension designs is handled by third-generation Magnetic Ride Control. Its sensors “read” the road every millisecond, triggering damping changes in as little as five milliseconds in electronically controlled shock absorbers that replace the SS’s conventional mechanical-valve shocks and struts. They’re filled with a magneto-rheological fluid containing minute iron particles and under the presence of a magnetic charge, the iron particles align to provide damping resistance. Changes in the magnetic charge alter the damping rate of the shocks, with changes occurring almost instantly, delivering more precise body motion control. That translates into greater feelings of precision, responsiveness and refinement, particularly on rougher roads or when cornering. The selectable Tour, Sport and Performance modes allow the driver to determine the amount of damping desired. A new, dual-mode exhaust system for the 2016 Chevrolet SS sedan complements the V-8 engine with quieter performance at low engine speeds and a more muscular engine note at wide-open throttle. Track-capable Brembo four-wheel disc brakes are standard, with ventilated 14-inch (355 mm) front rotors and 14.2-inch (360 mm) rear rotors. Four-piston aluminum calipers provide increased stiffness to reduce fluid displacement and caliper deformation without adding weight. The result is an enhancement to braking feel and overall vehicle dynamics. Electronic Brake Force Distribution optimizes control of rear brake pressure on all road surfaces and under all vehicle loading conditions. Electronic Brake Assist senses how hard and fast a driver depresses the brake pedal and gives extra braking assistance, if required. The SS’s steering system employs a variable-assist electric power steering system that saves fuel by drawing energy only when the wheels are turned. The variable-effort design provides lighter parking efforts at low speed and greater effort at higher speeds, for a more direct steering feel. The system is also calibrated to detect constant driver steering wheel load due to factors such as road camber and crosswind. The system will compensate to reduce steering effort to a more neutral level and lessen potential driver fatigue. The Chevrolet SS’s comprehensive collection of standard safety features employs advanced technologies – including radar – to help avoid crashes. Visual and audible alerts, depending on the alert feature, help drivers identify potential crash situations. They are designed to identify potential threats with sufficient warning to give the driver time to react and make changes. SS is also offers Automatic Parking Assist, which provides hands-free parking help. This standard features uses an ultrasonic sensing system to detect the width and depth of either parallel or reverse right-angle parking spaces. While the driver controls the throttle, transmission and brake, Automatic Parking Assist controls the steering inputs necessary to park the vehicle. Lane Departure Warning – A camera-based lane detection system warns the driver of impending lane changes. The camera, mounted near the inside rearview mirror, identifies traffic lane markings and provides audible alerts. Side Blind Zone Alert – Using radar sensors on both sides of the vehicle, the system “looks” for other vehicles in the blind zone areas of the SS and indicates their presence with LED-lit symbols in the outside mirrors. Rear Vision Camera – With a display in the center stack infotainment system, the camera provides a view of objects directly behind the SS. Eight air bags to help to maximize protection in severe impacts while minimizing injury risk to out-of-position occupants, including driver/front passenger dual-stage air bags, knee air bags for driver and the front passenger, side air bags and roof rail side curtain air bags, for head protection for front and second-row occupants. StabiliTrak electronic stability control and full-function traction control.